Last week’s ceasefire has held up better than I expected, but it is still very precarious. The good news, especially for civilians in the conflict zone, is that the level of violence is down considerably for where it was two weeks ago. On Wednesday, Ukrainian President Poroshenko claimed that some 70% of the Russian regular forces in eastern Ukraine had returned to Russia, while NATO reported on Thursday that the number of Russian regulars on Ukrainian soil was down to some 1000. It also appears that many of the Ukrainian servicemen caught behind Russian/pro-Russian lines when the ceasefire went into effect have made it back to Ukrainian-controlled territory. And there has been a significant number of prisoners exchanged. Nevertheless, the military situation is still very unstable, above all because the disposition of forces remains confused and there is no clear or agreed-upon line of separation. There continue to be reports of fighting, particularly regular and sometimes heavy shelling and rocket attacks in and around Donetsk, and I remain convinced that the separatists are not going to accept continued Ukrainian control of the Donetsk airport but will fight to secure it if necessary. On Thursday the Ukrainian National Defense and Security Council also seemed to contradict Poroshenko, stating that it could not confirm that Russian regulars were returning to Russia. And while the fighting around Mariupol has abated, the standoff there could easily break down, particularly if Russian/pro-Russian forces try to surround the city, even if they do not try to assault it (which is also possible). Finally, it is clear that the parties to the conflict remain very far apart on a possible political solution to the conflict. Poroshenko has made very clear that Kyiv will never surrender its claim to Crimea or the Donbas, and while he intends to push the Verkhovna Rada to adopt decentralization legislation, he has confirmed that he does not intend to push for the constitutional amendments needed to transform the state into a formal federation. He is also insisting that the special status for “certain districts” in the Donbas called for, vaguely, in the ceasefire agreement will not threaten Ukraine’s territorial integrity or undermine Kyiv’s sovereignty in the east, claims that in my view are almost certainly going to prove incorrect. All this is to say that I remain convinced that Kyiv has lost de facto sovereignty over the territory controlled by the separatists and is not going to get it back. Instead, we are very likely to see the consolidation of another so-called “frozen conflict” in post-Soviet space in the form of a de facto independent, but unrecognized, “People’s Republic of Novorossiya,” which will effectively be a protectorate of Russia. What has happened over the past two weeks is that borders of “Novorossiya” have probably become clearer, unless full-scale war resumes. This is not an outcome that Poroshenko can acknowledge or accept publicly, and it is one that most Ukrainians are going to find extremely hard to swallow. But unless they want to suffer more military defeats, the imbalance of hard power, and the ability of Russia to make life endlessly miserable for Ukraine proper, means that they are going to have to accept it, just as the governments and peoples of Georgia, Moldova, and Azerbaijan have had to accept, with great regret and sorrow, the loss of de facto sovereignty over Transnistria, Abkhazia, South Ossetia, and Nagorno-Karabakh. There are some important differences between Novorossiya and the other post-Soviet frozen conflicts that warrant mention, however. One is that the population of Novorossiya is much larger that the others – probably around 2 to 2.5 million people, depending on the borders it ends up with and how many civilians remain or return. This compares to a population of some 500,000 in Transnistria, less than 250,000 in Abkhazia, around 50,000 in South Ossetia, and around 150,000 in Nagorno-Karabakh. Additionally, Novorossiya will have a very long border with Ukraine, one without any clear geographical features along the so-called line-of-control, which means it will be more difficult to stabilize and for international monitors, if they are ever deployed, to keep the border stable. Finally, like Abkhazia and South Ossetia, but unlike Transnistria and Nagorno-Karabakh, Novorossiya is going to border on Russia, which has at least three consequences: (1) the region will be particularly dependent on Moscow for political and especially economic assistance; (2) Moscow is likely, at least eventually, to get part of the blame by the local population for the disorder and economic hardships that will plague the region for the foreseeable future; and (3) the criminality and other social problems that are going to afflict Novorossiya will at least to some extent spill over into Russia – and indeed into Ukraine proper as well. 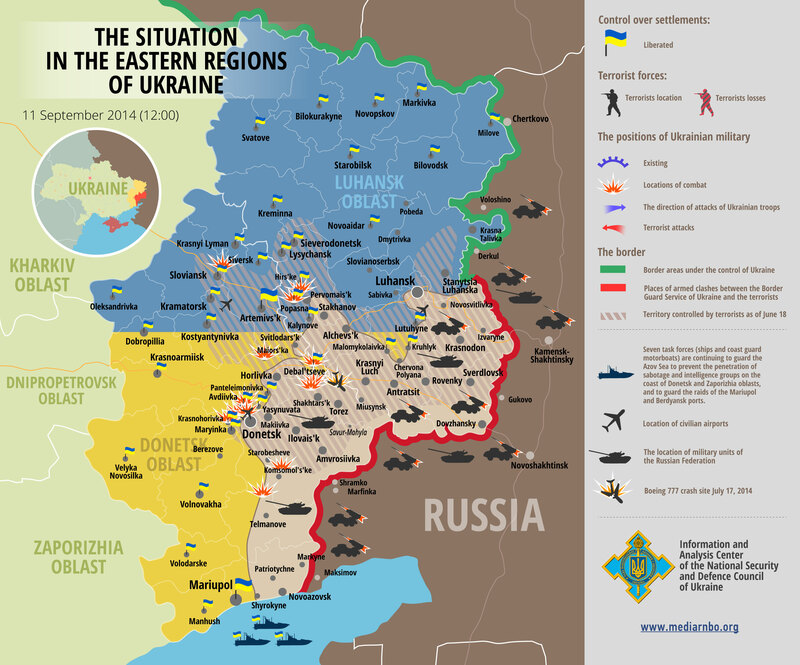 Still, the good news is that sustained and large-scale military operations in eastern Ukraine may have ended. The emphasis here is on may. It is still possible that an effort by the separatists to drive the Ukrainians back from Donetsk or invest Mariupol will lead to a resumption of fighting all along the front lines. And it is also possible that Moscow has decided, or will decide, that it needs a land corridor to Crimea, and perhaps even to Transnistria, in which case it will take the military measures needed to make that happen. At the least it is clear that Moscow is continuing to signal Kyiv that it is in a position to go further if it wants to – the Ukrainians are reporting a buildup of Russian forces in northern Crimea, and yesterday they claimed that Russian troops had set up a new checkpoint on the Ukraine-proper side of the Ukraine-proper/Crimea border (specifically, on a long peninsula connecting mainland Ukraine to Crimea). Also unlikely, but not inconceivable, is a decision by Kyiv – or more plausibly some of its volunteer battalions – to resume offensive operations, a decision that would almost certainly lead to another surge in Russian support and more defeats for the Ukrainians. If I am right, and we see the consolidation of a Russian breakaway protectorate in eastern Ukraine, what are the implications? My view is that an unrecognized Novorossiya People’s Republic is going to prove to be a very bad outcome for all parties. The citizens in the region are facing a devastated society, one in which large numbers of people have switched loyalties or turned on each other over the course of the fighting, as demonstrated in Slovyansk after the Ukrainians retook it. The economy of the region has also been devastated, and it is unclear that it is going to continue to receive massive subsidization of its heavy industries from underpriced Russian energy, let alone the investment needed to rebuild its destroyed enterprises and infrastructure, including bridges and roads. Meanwhile, the separatists are going to have to form a government despite their lack of unity and try to bring order to a lawless territory with a very heavily armed and now militarized population. As for the rest of Ukraine, it is in an acute economic crisis, and politically the ceasefire is going to prove very divisive and may well increase support for the far right. Russia’s other neighbors, including the Baltic states, can expect even more heavy-handed military, economic, and political pressure from Moscow. Russia, in turn, is going to be burdened with the economic costs of keeping the Donbas afloat, even as its economy continues to deteriorate in the face of Western sanctions and what may be a significant decline oil prices. The already economically distressed EU countries are going to suffer from the sanctions on Russia and from Russian retaliatory measures, which will be a boon to the region’s far right and will likely deepen the already serious intergovernmental tensions among EU member-states over Russian policy. Nor are EU governments going to want to foot the bill for restoring Ukraine’s finances. NATO will have to take additional measures, and its member-states, including the United States, are going to have to spend more, to defend NATO’s eastern borders, realizing all the while that defending the Baltic states is effectively impossible. And we are almost certainly going to witness a full-blown gas war over the coming winter. That said, I do not mean to suggest that the ceasefire is not a blessing for the civilians remaining in the conflict zone – it is. Moreover, the turn in the tide of battle over the past several weeks has at least meant that Ukrainian forces are not going to have to try to take Donetsk and Luhansk by force. There is a widespread assumption in much of the analysis that I have seen in the past week that the Ukrainians were on the verge of a decisive victory in the east before the surge in Russia’s indirect and direct military assistance. I rather doubt that, as I wrote at the time. Even if the Ukrainians had been able to fully surround Donetsk and Luhanks – which they never did – I suspect the assaults on Donetsk and Luhansk would have been very violent, bloody, and time consuming. The Ukrainians were never able to take Horlivka, a city of less than 300,000 residents just to the northeast of Donetsk, while their successful capture of Kramatorsk (pop. 175,000) and especially Slavyansk (pop. 130,000) caused many civilian deaths and a great deal of destruction. Moreover, my impression is that most of the civilian population still in the conflict zone, including those that were not particularly sympathetic to the separatists, blamed the Ukrainians for most of the shelling and rocket attacks on civilians. A bloody battle for Donetsk and Luhansk would very likely have reinforced those sentiments. The silver lining for Ukraine, then – such as it is – is that Kyiv is not going to have to further alienate the civilian population of the Donbas and then try to govern them. Neither is Kyiv going to have the burden of restoring its devastated economy. That, in no small measure, will be Russia’s problem. In the long run, a majority of Ukrainians may even conclude – the way I think most Moldovans have with respect to Transnistria – that a frozen conflict is preferable to the political and economic costs of trying to reintegrate the population of Novorossiya – and for that matter Crimea – into Ukraine. But that is a very long way off, and it will probably require many years of political stabilization and economic progress in the rest of the country. Finally, at the geopolitical level I remain convinced that we are in for a long period of costly and very dangerous confrontation with Russia over the external orientation of Ukraine, Georgia, Azerbaijan, Moldova, and even Belarus. As NATO builds up its presence in the east, Russia is going to respond by probing NATO’s eastern borders and by engaging in deliberate provocations along the Finnish border and elsewhere as well, with the attendant risk of some military incident. It is also now starting to militarize the Arctic by establishing a new Northern Command and increasing its military assets in the region. We may likewise see Russia withdraw from the INF treaty, deploy nuclear missiles targeting Western Europe, buildup its military position, including nuclear forces, in Kalingrad, and engage in cyberwar by proxy. Above all, I am convinced that the Kremlin will continue to do everything possible, hopefully short of all-out war, to keep the EU and NATO out of a region that not just Putin but the great bulk of the Russian political elite and public considers rightfully within Russia’s sphere of influence. Eventually, my hope is that realists in the West and in Russia come to realize that this is an irrationally costly and dangerous game, and that there is compelling need for new rules that reduce the costs of geopolitical confrontation and keep a Hot Peace from becoming a Hot War. That, I think, is much the preferable outcome for all parties. But it will very likely require some very unpleasant concessions on the part of the West – notably, acceptance of the reality, albeit not the legality or legitimacy, of Russia’s annexation of Crimea and establishment of Novorossiya, as well as acceptance that NATO has to abandon its long-held position that all “European” states that meet its vague criteria for membership and wish to can become NATO members. NATO is a club, and it is not obligated to take in countries that it does not want, particularly countries that it cannot or will not defend if push comes to shove, or whose membership will undermine, not enhance, either the collective security of its member-states or the security of Europe as a whole. In the best of all worlds, the result would be a Grand Bargain, or if you prefer detente, with Russia that provides for some kind of neutrality not only for Ukraine and Georgia but also for Belarus and Azerbaijan, a renewed commitment to the INF treaty, and a new Conventional Forces in Europe treaty providing for force dispositions and confidence building measures that make Russia less intent on endlessly destabilizing its neighbors. NOTE: This is an expanded version of a talk I gave at Simon Fraser University, Vancouver, Canada, on September 12, 2014.